Welcome to Day 33 of my #100DaysofBulletJournalIdeas Project! This is why, when I developed this tracker, I thought about what I like when it comes to planning (calendars - check), checking things off (on the mini calendar - check), reflection (days of the month listed with space for reflective notes - check), and that's it for this sweet little tracker with notes concept! 1. A mini calendar at the top to check off the days that you did the habit you're working on developing. 2. A monthly list with space each day to write down a short note about your progress for the day with said habit. 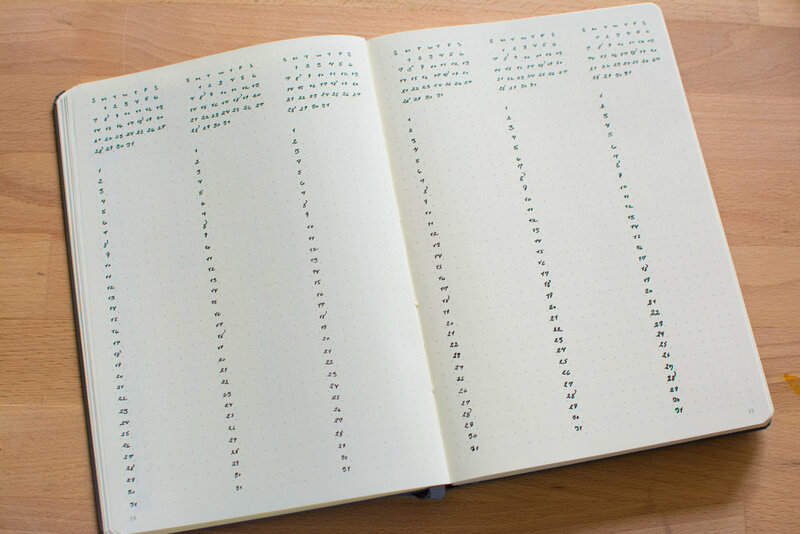 You would write down the habit you're working on across the top of each mini calendar. Feel free to add color or fun headers, I made this simple for the sake of simplicity. Here you can see an example of how it works. Each day, you check in with yourself and mark off whether you did the habit on the calendar. This will allow you to see at a glance your progress. Beneath that is a monthly list so that you can reflect daily on how you made progress or why you didn't make progress with that habit. This simple reflective act will keep you accountable. I hope you enjoyed this new kind of tracker! Focus on a few at a time. Track only what you're working on developing. Once you've already developed the habit, there's no need to keep tracking it unless that's your jam. Keep tracking until you feel you've nailed it.